With the growing adoption of private and public cloud platforms, many security teams feel that they are losing visibility and control. From the very basics of identifying which cloud services are being used, to the monitoring of security policies and potential violations, new solutions and procedures are required to regain control. Join us for this discussion of cloud security challenges and how they can be addressed. The webinar will feature an expert interview with Maurice Stebila, CISO at HARMAN International, who will share his insights and experience around security challenges in the cloud, much like he did recently at RSA conference in San Francisco. 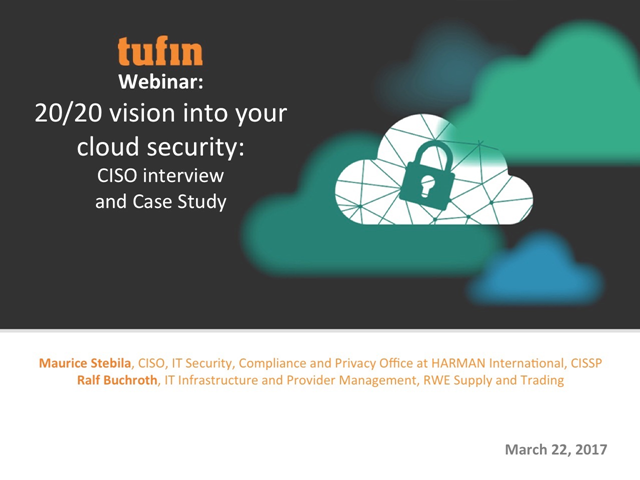 In the second half of the webinar, you will learn how one of Tufin’s customers, Ralf Buchroth, IT Infrastructure and Provider Management at RWE Supply and Trading, has deployed Tufin to address challenges of visibility and control in the cloud and across a hybrid network environment.